فلز سرب کاربردهای زیادی در صنایع گوناگون دارد. به‌دلیل سمی بودن این فلز، تخلیه پساب‌های صنعتی حاوی آن، خطرات جبران‌ناپذیری برای محیط زیست و اکوسیستم‌های زنده دارد. این پژوهش با هدف بررسی استفاده از خاک اره درخت اوکالیپتوس به‌عنوان جاذبی ارزان قیمت برای حذف سرب از پساب انجام شد. آزمایش‌ها در سیستم ناپیوسته انجام شد و تأثیر پارامترهای pH، مقدار جاذب، زمان تماس و غلظت اولیه سرب مورد بررسی قرار گرفت. باتوجه به نتایج، حداکثر راندمان جذب سرب 25/96 درصد بود که در pH و زمان تماس 7 و 30 دقیقه و مقدار جاذب 10گرم در لیتر به‌دست آمد. با افزایش غلظت اولیه سرب مقدار فلز جذب شده و درصد حذف افزایش یافت. داده‌های این مطالعه تطابق خوبی با ایزوترم لانگمیر نشان دادند. 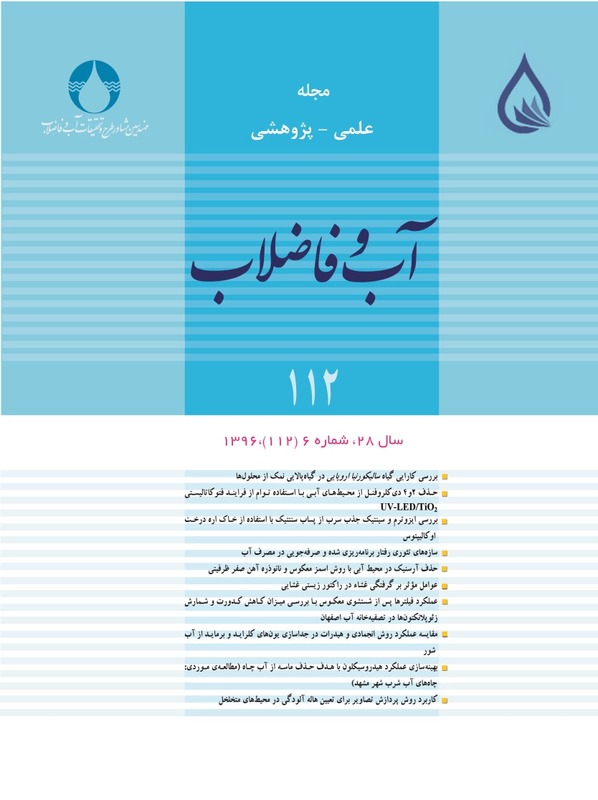 آنالیز سینتیک نشان داد که جذب سرب با مدل سینتیکی جذب مرتبه دوم مطابقت دارد (998/0=R2). با توجه به راندمان بالای حذف سرب توسط خاک اره درخت اوکالیپتوس می‌توان از این روش به‌عنوان روشی کارآمد و ارزان قیمت برای جذب سرب استفاده نمود. 1PhD Student, Young Researchers and Elite Club, Ahvaz Branch, Islamic Azad University, Ahvaz, Iran. Lead is a heavy metal which has many applications in different industries. Due to toxicity of lead, discharging industrial effluents which contain these ions will bring irreversible risks to the environment and living ecosystems. The objective of this study is to analyse the use of Eucalyptus sawdust as a cheap adsorbent for lead removal from effluent. The experiments were conducted in batch system and the effect of pH, the amount of adsorbent, contact time and the initial concentration of lead were examined. Noticing the results, the maximum efficiency of lead adsorption is 96.25% which was obtained in pH of 7 and contact time of 30 minutes and 10 g/L of adsorbent. By increasing the initial concentration of lead, the adsorbed metal and removal percentage also increased. Achieved data from this study indicated a good compatibility with Langmuir adsorption isotherm. Kinetic analysis indicated that lead adsorption matches with the second-order kinetic adsorption model (R2=0.998). Noticing the high efficiency of lead removal by Eucalyptus sawdust, this method could be used as an effective and cheap adsorbent for lead removal. Altin, O., Ho, O. & Dogu, T., 1998, "Use of general purpose adsorption isotherms for heavy metal claymineral interactions", Journal of Colloid and Interface Science, 198, 130-140. APHA, AWWA, WEF, 2005, Standard methods for the examination of water and wastewater, USA. Azizian, S., 2004, "Kinetic models of sorption: A theoritical analysis", Colloid and Interface Sci., 726, 47-52. Bayramoglu, G., Gursel, I., Tunali, Y. & Arica, M.Y., 2009, "Biosorption of phenol and 2-chlorophenol by Funalia trogii pellets", Bioresource Technolology 100(10), 2685-2691. Chen, Z., Ma, W. & Han, M., 2008, "Biosorption of nickel and copper onto treated alga (Undaria pinnatifida): Application of isotherm and kinetic models", Journal of Hazardous Matereials, 155(1),327-33. Chojnacka, K., Chojnacki, A. & Gorecka, H., 2005, "Biosorption of Cr 3+, Cd 2+ and Cu 2+ ions by blue–green algae Spirulina sp. Kinetics, equilibrium and the mechanism of the process", Chemosphere, 59(1),75-84. Davis, T.A., Volesky, B. & Vieira, R.H.S.F., 2000, "Sargassum seaweed as biosorbent for heavy metals", Water Research, 34(17), 4270-4278. Fan, X., Parker, D.J. & Smith, M.D., 2003, "Adsorption kinetics of fluoride on low cost materials", Water Research, 37, 4929-4937. Freundlich, H.M.F., 1906, "Uber die adsorption in losungen", Journal of Physical Chemistry, 57(A), 385-470. Jaafarzadeh, N., Mengelizadeh, N. & Hormozinejad, M., 2013, "Adsorption of Zn (II) from aqueous solution by using chitin extracted from shrimp shells", Jentashapir Journal of Health Research, 5(3),131-139. Langmuir, I., 1916, "The constitution and fundamental properties of solids and liquids", J. An. Chem. Soc.,38, 2221-2295. Malkoc, E. & Nuhoglo, Y., 2005, "Investigations of nickel(II) removal from aqueous solutions using tea factory waste", Journal of Hazardous Materials, 127, 120-128. Nabizadeh, R., Naddafi, K., Saeedi, R., Mahvi, A., Vaezi, F. & Nazmara, K.Y.S., 2005, "Kinetic and equilibrium studies of Lead and Cadmium biosorption from aqueous solutions by Sargassum Spp. Biomass", Journal of Environmental Health Science & Engineering, 2(3),159-168. Nemr, A.E., 2009, "Potential of pomegranate husk carbon for Cr(VI) removal from wastewater: Kinetic andisotherm studies", Journal of Hazardous Materials, 161, 132-141. O’Connell, D.W., Birkinshaw, C. & O’Dwyer, T.F., 2008, "Heavy metal adsorbents prepared from themodification of cellulose", Journal of Bioresource Technology, 99(15), 6709-6724. Özer, D., Özer, A. & Dursun, G., 2008, "Investigation of zinc (II) adsorption on Cladophora crispata in a two‐staged reactor", Journal of Chem. Technol. Biotechnol., 75(5), 410-416. Saki, P., Mafi Gholami, R. & Takdastan, A., 2013, "Removal of cadmium from industrial wastewater by steel slag", Jundishapur Journal of Health Sciences, 5(1), 23-33. Shams Khorramabadi, Gh., Darvishi Cheshmeh Soltani, R. & Jorfi, S., 2010, "Cd(II) adsorption using waste sludge from a municipal wastewater treatment system", Journal of Water and Wastewater, Vol. 21 No. 1(73), 57-62. (In Persian). Siva Kumar, N., Woo, H.S. & Min, K., 2012, "Equilibrium and kinetic studies on biosorption of 2,4,6-trichlorophenol from aqueous solutions by Acacia leucocephala bark", Colloids and Surfaces B:Biointerfaces, 94(0), 125-132. Sreejalekshmi, K.G., Krishnan, K.A. & Anirudhan, T.S., 2002, "Adsorption of Pb(II) and Pb(II)-citric acid on sawdust activated carbon: Kinetic and equilibrium isotherm studies", Journal of Hazardous Materials, 161(2-3), 1506-1513.